TEDDINET is a multi-disciplinary research project to monitor the energy usage of homes and appliances, and work out ways to reduce it. From 2013 up until 2016, millions of sensor readings have been taken from hundreds of homes, recording data such as power usage, temperature, humidity, and sound levels. Now that all the data have been gathered, we have to figure out how to process it to make it easy to query and visualise. The first technologies I'm looking at are RDF and SPARQL, tools that were originally developed for the semantic web. RDF is a way of describing graphs in subject-predicate-object triples. A simple way to think of these triples is that the subject and object refer to things (nodes on a graph), and the predicate describes their relationship (the edges on a graph). Because it was designed for the semantic web, each part of a triple must refer to a specific instance of something using a unique identifier called a URI. A URI is similar to a web address, pointing to an address that can be used to identify a particular resource. The above triples are in the "n-triples" format, which is an XML representation of RDF triples. This format is a little verbose, as it uses one line per triple. A more efficient RDF representation is the "Turtle" format, which allows us to specify a subject with all of its predicates and objects separated by semicolons (and indented for legibility). The beauty of RDF is the way it expresses data as a graph. This means that we should be able to query it without knowing too much about particular structure of the database its stored in. Contrast this with SQL, where one must know the exact layout of a database's tables in order to query it. It also allows us to join graphs together, querying databases (known as triple stores in RDF parlance) from entirely separate locations with the same query. Querying across multiple datasets in this way is called federated querying. Due to the expression of our data in terms of triples, we must query them with a special language called SPARQL. SPARQL resembles SQL on a superficial level, but it allows for much more expressive queries in terms of triples. These data were originally gathered using sensors attached to Raspberry PIs, and stored in a mySQL database. In order for us to query them with SPARQL, we converted them into RDF triples to load into a Jena triple store (the process is described in this blog post). This allowed us to create a "SPARQL endpoint", a web service to which we can send SPARQL queries to retrieve our data. "Get every subject, predicate and object in our datastore, and return them as "s", "p" and "o" variables. But we only want the first 20!" Certain keywords (SELECT and LIMIT) are used in much the same way as their SQL counterparts, but the naming of variables to be returned with the question mark (?) operator is new, as is their arrangement in triples. Once a user becomes familiar with SPARQL, it becomes a powerful, expressive and flexible way to query RDF triples. A good way to start learning the basics of SPARQL is with the Apache Jena SPARQL tutorial. It is clear that these are the first twenty triples of millions (1.25 billion, to be exact). What if we want to query just a sample of the data, in order to get just enough for a representative visualisation without having to process millions of results? 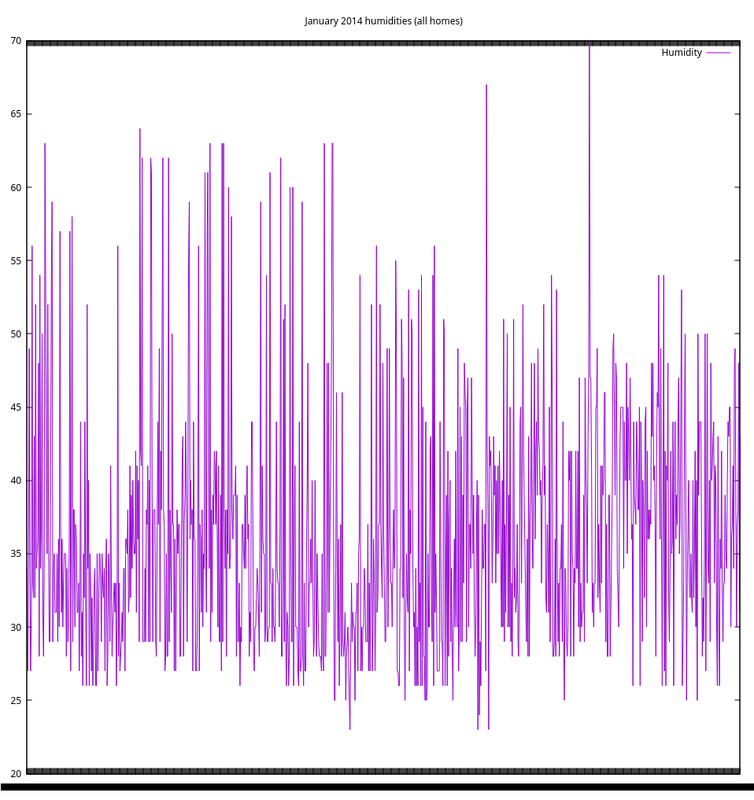 Let's try querying a subset of the data that returns millions of results: the humidity level readings. 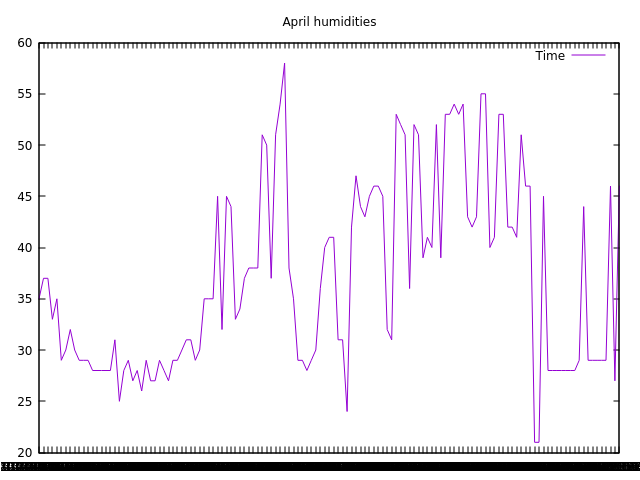 A good example query to try would be to get all humidity readings across all homes for April 2013. However, this query will result in a timeout on most SPARQL endpoints, taking more than 10 minutes to return a result. This is because it must order our (potentially millions of) humidity readings randomly before returning 25 of them. This is too expensive. Can we do better? This query binds a random number to each result, then filters them down to only the results with random numbers below a certain threshold (0.01 in this case). This query will take too long and time out, however (with our server timeout threshold set to 30 seconds). This is because it is still going through every triple in the database, binding a random number to it, and also applying the filter comparators to find only the readings that match the month we want. This is far too expensive! How can we make this more efficient? This random sampling method is orders of magnitude faster than the ORDER BY RAND() method, returning our results in under 2 seconds. One of the main goals of our project is to query across multiple datasets at once. We can test this out by querying the REFIT dataset from the University of Strathclyde. We've converted this data from the CSV source to RDF triples, using the same ontology as the ENLITEN dataset (the SEAS ontology), and put them on a separate SPARQL endpoint called "refit". We have to guess the threshold values to select the random samples from. These values should be proportional to the number of triples being sampled from, so in theory we could use SPARQL's COUNT() aggregator function to get this information. In practice, however, the COUNT() function takes a long time to return a value, too long to be practical for our uses. SPARQL and RDF have many strengths for semantic querying of data. However, for our purposes it has presented several challenges. The largest is that we need a quick way to get a random sample of the data, which is both difficult to describe in SPARQL and takes a long time for any triple store to return. The takeaway from this experiment is that we need to explore hybrid systems that combine the flexible semantic querying capabilities of RDF and SPARQL with the streaming capabilities of other data formats.